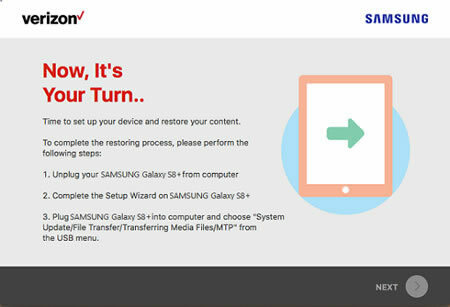 This helps you repair the software on your Samsung device using your computer. El proceso de reparación puede demorar hasta 30-90 minutos. No desconectes el dispositivo de la computadora durante este proceso. Para usar el asistente de reparación de software (SRA), asegúrate de que el dispositivo móvil esté encendido y habilitado para desbloquearlo si fuera necesario, luego conéctalo a una computadora compatible usando el cable USB provisto. 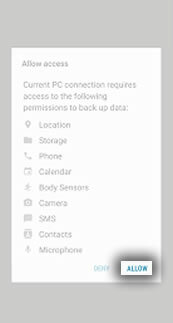 If the device is not recognized immediately, pull down the notification panel to switch the device mode from 'Charge Only' to 'MTP', 'File Transfer' or 'Software Installation' mode. For those devices without the 'File Transfer' option (e.g., Galaxy S7, etc. ), tap 'Connected for charging: touch for other USB options' then tap 'Transferring Media Files'. La versión más reciente del software estará disponible en la herramienta SUA/SRA dentro de una semana a partir del lanzamiento de la nueva actualización de software. During this time, the SUA/SRA is unavailable. Asegúrate de que el asistente para actualización de software esté instalado. Consulta Configuración inicial - Software Upgrade Assistant para obtener ayuda. 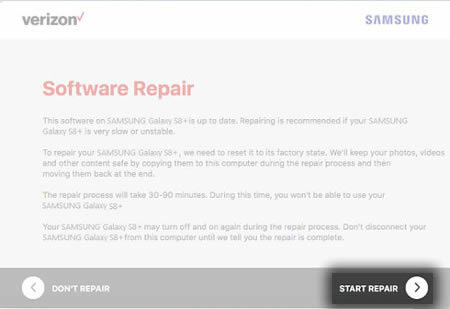 If the software doesn't download from your device after plugging into your computer, download from Samsung's website then click Open. From the Windows® desktop, navigate Start > All Programs (Programs) > Verizon > Launch Utility Application (Samsung) then skip to step 5. Para las computadoras que tengan Windows 8 o 10, salta este paso y comienza con el paso 3. For Mac®, click the Software Upgrade Assistant tray icon then skip to step 5. From the Windows desktop, tap or click the Utility Launcher icon (located in the lower-right taskbar near the time display). The Utility Launcher icon is located on the desktop, not the screen with tiles. Si aparecen mosaicos, haz clic en el botón de inicio Windows (ubicado en la parte inferior izquierda) para ver el escritorio de Windows. 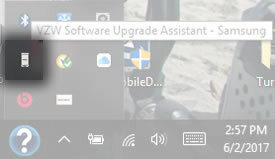 Left-click the Software Upgrade Assistant launcher icon. From the 'Software Repair' screen, tap or click Start Repair. If the device's software is not current the user is prompted to update. 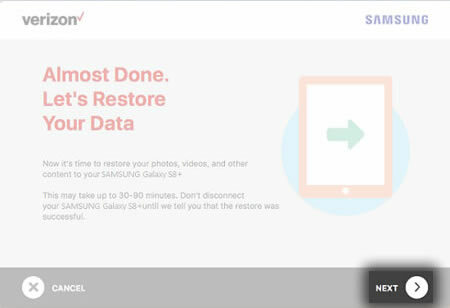 If presented with the message concerning data being erased, tap or click Continue, provided the data has been backed up. 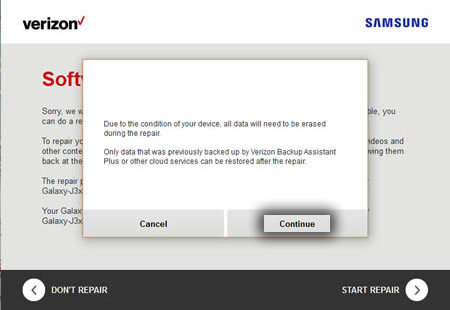 If it has not, tap or click Cancel, back up your data and start the repair again. On the 'Allow access' screen, tap or click ALLOW. The available info may vary. 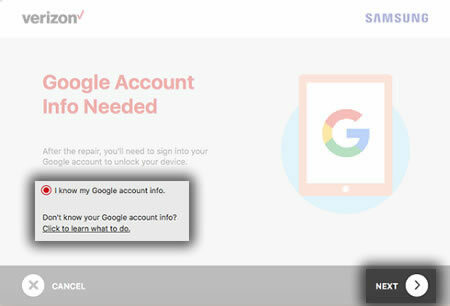 If presented with the 'Google Account Info Needed' screen, tap or click I know my Google account info then tap or click NEXT to begin the Back up process. If your Google info is unknown, click the 'Don't know your Google account info?' link and follow the instructions. On the 'Now It's Your Turn' screen, unplug your device from the laptop/computer and follow the instructions on the screen. After the phone has been set back up, re-connect it to the laptop/computer and tap or click NEXT. Device restore may take 30 - 90 minutes. Once the restore process completes, tap or click EXIT and unplug the device.